Warm welcome to Valerio Agostini, Italy, and Václav Kotěšovec, Czech Republic! No.51 – h#2 by Valerio Agostini – Einstein Chess, Miniature. No.52 – h#2 by Valerio Agostini – Nice and non-standard dual-avoidance play. No.52.1 – h#2 by Valerio Agostini – This problem is an improvement of No.52 based on the received comments. No.53 – h#7 by Václav Kotěšovec – An excellent triple echo-play, typical for Kotěšovec’s grand style! No.54 – h#30 by Václav Kotěšovec – Author tells that this problem was composed with help of computer! Kamikaze-piece: As a capturing unit, this piece disappears. KÖKO: A move is possible only if the piece moved arrives on a square next to another unit. Alphabetical Chess: The squares are considered in the order a1, a2…a8, b1…b8, c1 and so on to h8. At each turn, only the unit standing on the square which comes earliest in this order may move. However check and mate are normal. I like both the problems by the master of Italy. The miniature has nice play, the knights turning into pawn three times, the converted black pawn being used everytime for capture by queen. Excellent unity! In N.52 the black play is complex opening and closing lines everytime! 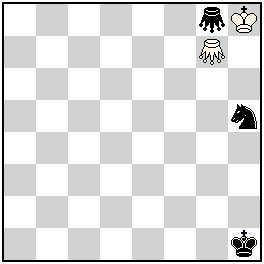 Twice white has to close the opened line resulting in B/W Umnov. Usually Umnov play in helpmates is nothing special, but here not so simple ! Complex but great clarity and unity of idea. 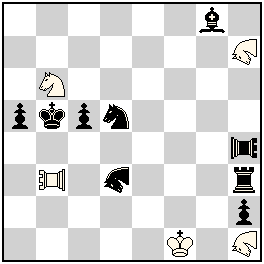 White: Nh7, Pd4, Pao b3, Sb2, Kb1, Nh1. 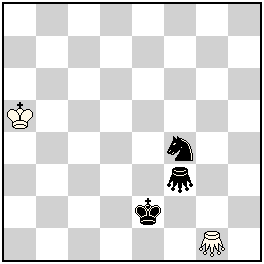 Black: KAb8, Bg8, Pa5, Kb5, Sd5 Pf4, Nd3, Rf3. Probably not an improvement, as in this version, the unified play of black on both solutions to f4 is not there. Just an exercise in construction ! Thanks Mr.Agostini. No.51 Valerio Agostini – Interesting and pleasant miniature, although the play is not quite homogeneous. No.52 Valerio Agostini – An ambitious and rich thematic complex! But in my opinion, here the figure KRh4 stands too “cold”. As a kind of figure, KRh4 is quite different from the available material in the problem. And this somewhat distorts the harmony. If we use Kamikaze-figures in a task, we need more expressive to emphasize their thematic effect. But here the use of KRh4 seems rather incidental. I would replace this figure with Rook-Locust h4 (C+).But this is a strictly subjective opinion! Theoretically, another way to remove the KRh4 is the placement on this field of a white figure (from Hopper`s type!) that will be included after the moves Sf4/Nf4 along the line, for example – white Kangaroo, or Lion, etc. 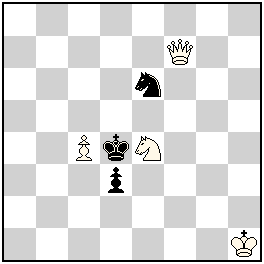 Other possibilities: to change Bg8 and Rh3 with Bishop-Locust -g8 and Rook – Locust h3 – this modification gives some chances to create a Meredith-position. Here it’s possible also to work with twins with goal to create model mates! In other words, the mechanism of Valerio is very rich and requires some more experimental work, perhaps. An interesting suggestion from IGM Petkov is to use a white Kangaroo or another hopper on h4. This will probably be used to guard c4. 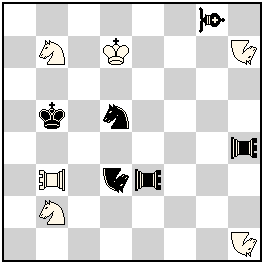 The difficulty I noted was to prevent the white piece on h4 from guarding b4 also, as opening of guard of this square by Nh1 is needed thematically. (Hence, my suggestion to use black Kangaroo on b8). But as the IGM notes, this is a rich mechanism, deserving everyone’s attention.